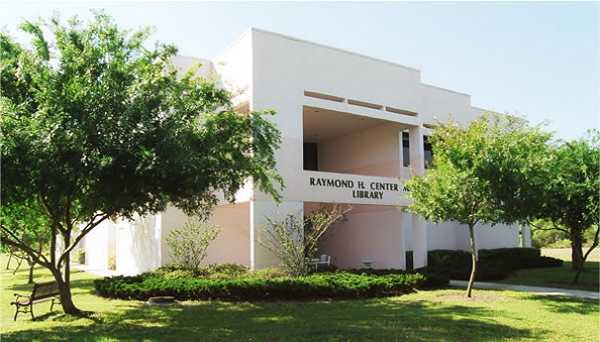 Raymond H. Center Library is the student's access to information and services necessary for satisfying course requirements, personal enrichment and vocation preparation. Originally built through generous gifts of Dr. Raymond H. Center and Dr. James P. Giles, Raymond H. Center Library contains over 35,000 volumes and 24 current print periodical subscriptions, as well as, over 160,000 ebooks and 10,000 periodicals available as e-resources through our databases. Special collections include all Trinity College of Florida's student senior research thesis and a pre-1900 book collection once belonging to E.C. Bragg, a long standing faculty and administrator of Trinity College. The library offers a number of services including interlibrary loan, research consultations with a faculty librarian, reference assistance and more. Collaborative spaces within the library are available for group study along with quiet areas for individual study. A number of computers, and a photocopier, printer and scanner are also available for patron use. The library is a member of several professional networks- the Tampa bay Library Consortium (TBLC), Independent Colleges and Universities of Florida library group, the Online Computer Library Center (OCLC) and the Christian Library Consortium- which expands the available resources to over 194 million records from libraries in 112 countries and territories. The Library Director is also a member of the American Library Association and the Association of Christian Librarians. In addition to serving our campus population, Raymond H. Center Library is open to the public whether through onsite visits or through our online services. Our dedicated and trained library staff are always ready to give assistance and service whenever needed.